Mt. Everest is not just the highest mountain in the world, but also a summit of every adventure lover’s aspiration. Every year, thousands of adventurers visit Nepal with an aspiration to climb the apogee of planet earth. For them, mountaineering at the Mt. Everest serves as the fulfillment of a lifelong dream. More than just an achievement, the moment of reaching the mountain’s top can be the iconic moment of any body’s life. For the feat like this doesn’t come that easy. It requires a mountaineer to be physically fit and alert at all situations. Also, a special hiking license needs to be obtained from National Mountaineering institute prior to the expedition of a lifetime on Mt. Everest. On this Everest expedition and its challenging terrain, you will not be all alone. The expert Sherpa guides will be with you throughout the expedition. 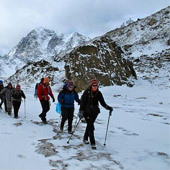 Highly regarded as elite mountaineers, Sherpas know the extreme mountainous terrain really well and accompany the trekkers with their wisdom and acumen throughout the trek. Everything looks short when you climb the highest point on earth and earn the greatest pleasure of life after overcoming all the odds. Surely, it is a rare experience to be earned only with Mt. Everest Tour. 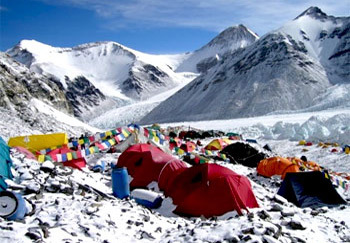 Everest Base Camp Tour is a famous challenging trek in the remote Nepal and is also the best way to have a glimpse of the highest mountain in the world. The itinerary is apt for those who want to spend time in nature and have a more than a fortnight’s time to enjoy the rugged terrain of magnificent mountains. Upon arrival at Tribhuvan International Airport in Kathmandu, meet and greet Destinations Beyond India representative. Meet the trekking guide or hang around the city. Dinner and overnight stay. Today after breakfast, start a guided tour to the most historical and spiritual attractions in Kathmandu. Some of these landmarks are considered World Heritage Sites; including the historic Durbar Square, the sacred Hindu temple of Pashupati Nath, the famous 'Monkey Temple' (Swayambhunath) and Buddhists shrine (BouddhaNath) which is one of the large Stupas in the world. At the noon, there will be a pre-trip discussion where we can meet our trek leader and other team members. Interact with trekking guides for the upcoming adventure. Overnight at Kathmandu. After breakfast, take an early morning flight to Lukla (2,800m/9,186ft) from Kathmandu, a gateway destination to the Everest base camp trek. After an adventurous 40 minute flight above the breathtaking green and white mountains, we reach the Tenzing-Hillary Airport at Lukla. This is one of the most beautiful air routes in the world culminating in a dramatic landing on a hillside surrounded by high mountains peaks. Upon arrival at Lukla, we meet our other crew members and after some packing and arrangements, we start our trek through the prosperous village of Lukla until we reach Phakding. To assist in acclimatization, we only have a short hike today. However, if interested in additional activities we can take a side trip to a nearby monastery. Overnight in Phakding. Today is the climax of our trip. We start early in the morning to catch the dramatic views from Kala Patthar and witness the first light of day caress the peaks of the mountains, particularly, Mt. Everest. However, we need to be prepared for an early morning departure, amid predawn darkness and cold temperature (-10 to -14 C). Further, there is always the potential for chilly winds which are quite common. 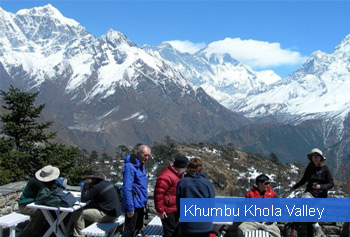 Familiar peaks such as Lingtren, Khumbutse, Changtse tower to the east even as Everest begins to reveal itself. During the ascent to Kala Patthar, we can pause to catch breath at several outstanding view points from where we can snap great pictures. After several hours of ascent, we reach Kala Patthar. From kala Patthar, we scramble up to the top of a rocky outcrop marked by cairns and prayer flags. Mind-blowing Himalayan panorama unfolds before our eyes as they wander from one mighty massif to another. We can take as many pictures as we want with our camera but do noy forget to imprint the vista into our mind's eye so that it lasts a lifetime. On being back to Gorak Shep, we have breakfast and wait other participants to return. The trail to Namche Bazar clings to the steep wooded slope beyond Kyangjuma, winding through several bends. We lookout for wildlife such as mountain goats, snow leopards, and colourful pheasants while passing through the forest by the trail. 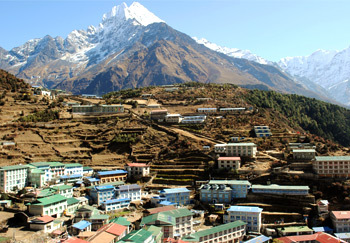 We have enough time in Namche to shop and relax in a bakery that serves coffee and cakes, and provides Internet access. A steep descent from Namche Hill leads to the suspension bridge crossing the Dudh Kosi river near the confluence of the Dhudh Koshi and the Bhote Koshi Rivers. We cross the Dudh Koshi River twice at separate locations before reaching Monjo. We are out of the Sagarmatha National Park after exiting from its official entrance near Monjo and finally reach Monjo Village. Not only is Monjo a quieter place to stay than Namche, it also means our porters have a less strenuous walk back to Lukla tomorrow. Overnight in Monjo. Today we enjoy the last walk at lower altitude in the Everest region. Most tracks today is flat although we will have some descends and brief ascents too. Today, we further enjoy a combo of open plains, rhododendron and pine forests, and in the distant background Kwangde peak. As we walk through the Sherpa villages, we notice impressive display of faith in Buddhism and cultural practices associated with it as prayer stones dot the landscape and prayer flags flap in the wind. We cross the Dhud Koshi River three times through the prayer flags strewn suspension bridges and also cross one of its tributary, Thado Koshi once. The final ascent of about 45 minutes from Chheplung takes us to Lukla, where we stretch our fatigued legs and recall the experiences of the last couple of weeks. Our fantastic trek culminates on a happy note with everyone back safe and sound with faces that show happiness! This last evening in the mountains is the ideal opportunity to spend some relaxing moments with whole crew as the porters will not accompany with us to Kathmandu. Overnight at Lukla. Today, we fly back to Kathmandu after our long mountain journey. The early morning flight drops us in Kathmandu. 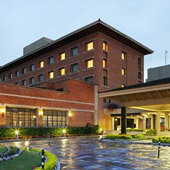 We can rest and relax throughout the day at hotel. 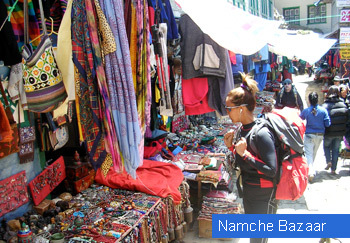 If we get interested to take some gifts home from Nepal for friends and relatives, we can visit to some nearby shops or venture out in Thamel for typical Nepalese goods. This short excursion either can be assisted by guides or we can do it ourselves too. 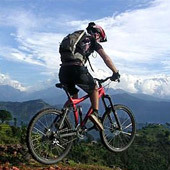 If we want to explore any other areas in Kathmandu, we have manage time for this today as well! At the evening we will be at a fantastic celebration dinner together for successfully completing our trek to Everest Base Camp! Overnight in Kathmandu. The journey within the mountains of Nepal comes to an end today! Check out Kathmandu in time to board the flight for onward destination.